Find additional Sessions and Codelabs, as well as new App Reviews, Office Hours, and After Hours events. Times and locations for all events are also now available, so you can start planning accordingly. New this year: we'll have a series of Keynote Sessions, which take a broader look at how the technology we build can impact the world around us! The I/O schedule is subject to change until the event, so check back often, and keep an eye out for scheduled Meetup events taking place at the Community Lounge to help you connect and network with other developers. To help make it easier to attend your favorite talks and minimize lines, confirmed attendees will be able to reserve seats for Sessions in advance of I/O - as long as they’re signed in with the same email address used to register for the 2018 event. A portion of seats will still be available first-come, first-served onsite. 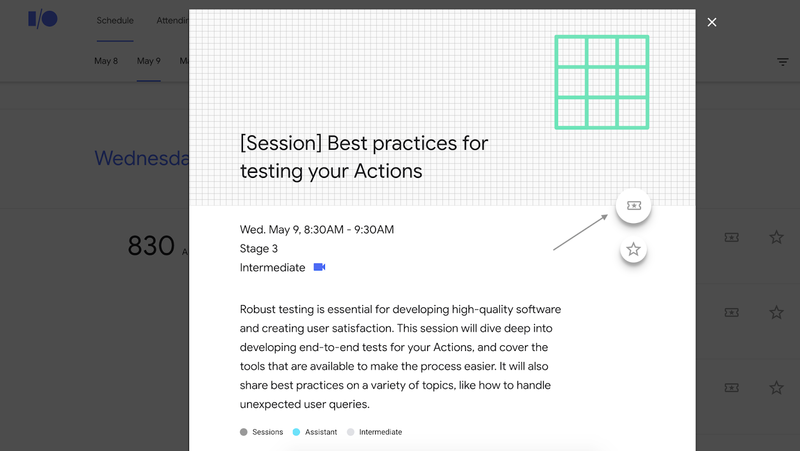 Navigate to google.com/io/schedule, sign in, and click on the ticket icon for each Session you want to reserve. If a particular Session has already reached the reservation capacity, you'll see an hourglass icon instead. If you've joined a waitlist and a spot opens up, we'll automatically change your reservation status to reserved. You can reserve as many Sessions as you'd like per day, but only one reservation/waitlist per time slot is allowed. Reservations will remain open until 1 hour before the start time for each Session. NOTE: Reservations are only available for Sessions, not other event types listed on the schedule. …Or via the Session detail pages. Anyone who's signed in can also star all event types listed on the schedule as a way to easily find them later on or on other devices. 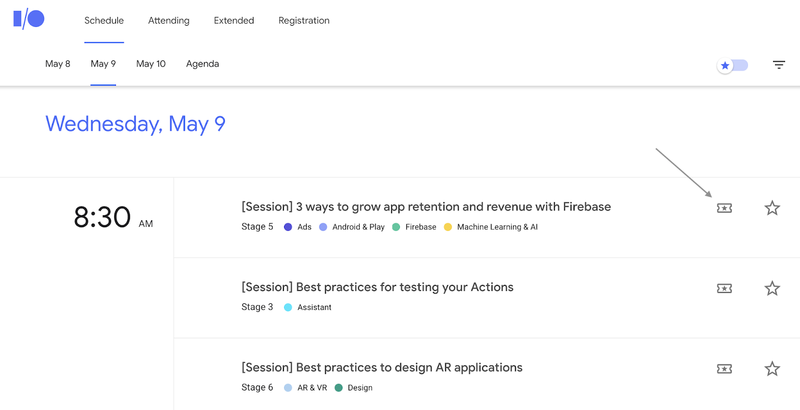 In addition to more than 160 technical and Keynote Sessions, onsite guests will have the chance to explore various Sandbox domes, covering product areas like Android, Assistant, Design, IoT, Web, just to name a few. Sandboxes are dedicated spaces to learn and play with our latest products and platforms via interactive demos, physical installations, and more. You can also take advantage of 100+ Office Hours and App Reviews. Office Hours gives you a chance to meet one-on-one with Google experts to ask all your technical questions, and App Reviews will give you the opportunity to receive advice and tips on your specific app-related projects. Don't forget to save time in your schedule for Codelabs. Here, you'll have everything you need to learn about the latest and greatest Google technologies via self-paced tutorials, or bring your own machine and take your work home with you. Google staff will be on hand for helpful advice and to provide direction if you get stuck. Don't worry - you're not alone and you won't miss a thing! We'll be livestreaming the majority of our Keynotes and Sessions from Shoreline. If you prefer to watch I/O with your developer community, find an I/O Extended viewing party near you. We'll also let you experience I/O firsthand via our I/O Guides who will be touring the venue and giving you eyes on the ground. I/O is only 27 days away! We'll continue to share updates in the upcoming weeks to help you get ready and make the most of this year's event. Stay tuned! The Google I/O 2018 schedule just got a big update!